Only two Senate Republicans from the entire conference of 54 members have admitted they read the details of President Barack Obama’s secret Trans Pacific Partnership (TPP) trade deal as of this time. With the first votes on the Trade Promotion Authority (TPA) that would fast-track TPP just days away, it’s looking like Senate Majority Leader Mitch McConnell expects Americans to accept former House Speaker Nancy Pelosi’s Obamacare logic for the trade deal: you have to pass it to find out what’s in it. 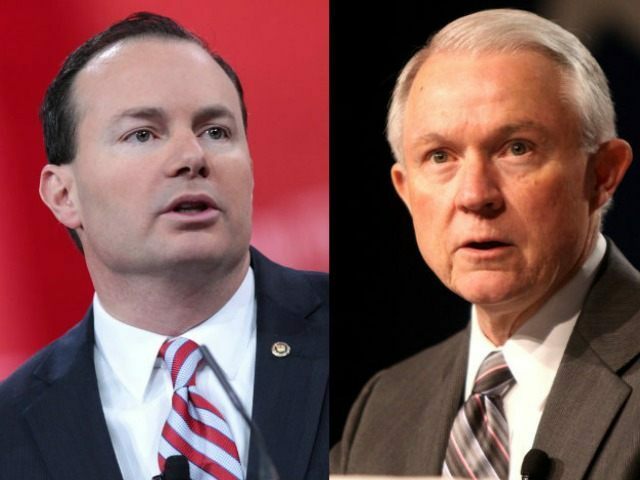 Sen. Jeff Sessions (R-AL) has on numerous occasions publicly stated he has read the TPP—which is locked away in a secret room in the Capitol, access to which only lawmakers and certain staffers with high-level clearance are provided—and a spokeswoman for Sen. Mike Lee (R-UT) on Thursday told Breitbart News that the Senator has read it as well. Despite asking press staff for every U.S. Senate Republican office throughout the day Thursday if their office’s senator has visited the secret room to read the deal—specifically the controversial “living agreement” contained within it—only Sessions and Lee would confirm they visited the room to read it. “The senator has reviewed the TPP document and is still undecided on the issue,” Emily Long, Lee’s press secretary, said in an email. A spokesman for Sen. James Lankford (R-OK) said that while the senator hasn’t reviewed the TPP text, he is scheduled to do so on Friday. Lankford, like Lee, is undecided at this time on TPP and TPA. “Senator Lankford is still gathering information about the legislation, but he is also conveying his trade priorities privately with Senate leadership and key Congressional leaders on trade,” DJ Jordan, Lankford’s communications director, said in an email. Breitbart News asked every single Republican Senator’s office on Capitol Hill a set of three basic questions. The first is whether the senator actually read the deal—and specifically the “living agreement” section contained within. “Has the senator gone into the room where the Trans-Pacific Partnership (TPP) is bend held and read the ‘living agreement’ section of the deal that is not available to the public (and which senators can’t even take notes about)?” Breitbart News asked every single office. Again, only Sessions and Lee confirmed they did. That doesn’t necessarily mean that zero other GOP senators read the deal. It just means that, given a full business day to publicly say they did and not responding, they have now chosen to give off the impression that just days before they will vote on it they haven’t read it. The so-called “living agreement” section of the TPP deal is extraordinarily controversial, and it’s now abundantly clear that the vast majority of Republican members of the U.S. Senate who will be voting on it next week—with the exception of Sessions and Lee—don’t even know what they’re talking about. “This means the President could update the agreement ‘as appropriate to address trade issues that emerge in the future as well as new issues that arise with the expansion of the agreement to include new countries,’” Sessions wrote about the living agreement in his “critical alert” to members across Capitol Hill about concerns with the deal last week. “The ‘living agreement’ provision means that participating nations could both add countries to the TPP without Congress’ approval (like China), and could also change any of the terms of the agreement, including in controversial areas such as the entry of foreign workers and foreign employees. Again: these changes would not be subject to congressional approval. “This has far-reaching implications: the Congressional Research Service reports that if the United States signs on to an international trade agreement, the implementing legislation of that trade agreement (as a law passed later in time) would supersede conflicting federal, state, and local laws. When this occurs, U.S. workers may be subject to a sudden change in tariffs, regulations, or dispute resolution proceedings in international tribunals outside the U.S. Sessions, on Wednesday, wrote to President Barack Obama asking him to make the TPP’s “living agreement” public before members were asked to vote on TPA. Not one GOP Senate office answered any of the questions—Sessions excluded, of course, because these are concerns he raised—but some did provide subtle quotes or other responses. A spokeswoman for Sen. Richard Shelby (R-AL), Sessions’ colleague from Alabama, said he shares Sessions’ concerns with the TPA deal—but wouldn’t say if he’s gone to the room to read the TPP document. “Senator Shelby shares Senator Sessions’ concerns and looks forward to a robust debate on TPA,” Shelby spokeswoman Torrie Miller said in an email. Amanda Carpenter, the spokeswoman for Sen. Ted Cruz (R-TX), didn’t answer whether the Senator—who supports TPA, as he laid out in a Wall Street Journal op-ed with House Ways and Means Committee chairman Rep. Paul Ryan (R-WI)—has read the text of the TPP deal either. “We are focused on Iran for today,” Carpenter said when asked about it on Thursday. A spokesman for Sen. Mike Enzi (R-WY) wouldn’t answer the questions—including if his boss went to the secret room to read the bill—but did provide a quote in response to them. “Senator Sessions is a friend of Senator Enzi. Senator Enzi appreciates Sessions diligence on this issue and values his opinion,” Max D’Onofrio, Enzi’s spokesman, said in an email. “Senator Enzi is hopeful that the Senate will be able to have an open and full debate on the Senate floor about the important concerns that senators may bring up in relation to the Trade Promotion Authority and Trans-Pacific Partnership (TPP). Brian Reisinger, a spokesman for Sen. Lamar Alexander (R-TN), said without answering the question about whether he’s read the TPP deal or any of the specific other questions, that his boss supports the deal because he thinks it’ll be good for the soybean, auto parts, and medical device industries. While the office of Sen. Lindsey Graham (R-SC) didn’t respond to those specific questions from Breitbart News, Graham’s campaign arm was asked for his stance on the Obama trade deal—since most GOP presidential candidates have taken a position one way or another on the deal, most being against. Graham is considering running for president. His campaign spokeswoman Brittany Bramell said he’s as of yet undecided but working to try to change several parts of it. “Senator Graham is working actively with leadership and sponsors of the legislation to see if there is a balance between this legislation and essential efforts to stop currency manipulation,” Bramell said in an email. It’s worth noting that not one member of Senate Republican leadership would say they read the deal as a whole—or have viewed the controversial “living agreement” contained within—either. That means Sen. Mitch McConnell (R-KY), the Majority Leader, may not have even read it, and the same goes for Senate Majority Whip Sen. John Cornyn (R-TX) and Senate Republican conference chairman Sen. John Thune (R-SD). It certainly means McConnell doesn’t require his members to read what they’re actually voting on before doing scheduling votes–and may endanger the presidential candidacy of his Kentucky colleague Sen. Rand Paul (R-KY). McConnell has endorsed Paul, who has made making a requirement of lawmakers to read legislation before voting on it a centerpiece of his campaign. By the same token, however, it’s worth noting that Paul’s Senate office hasn’t responded to Breitbart News’ questions about this matter either—and it’s unclear where he’s at on the TPP or the TPA that would fast-track it. Spokespeople for Sen. Marco Rubio (R-FL), who is in favor of the deal and is also running for president, didn’t answer if he read it either. The issue is shaping up as a major 2016 presidential campaign issue, and Sens. Cruz and Rubio join former Florida Gov. Jeb Bush and former Texas Gov. Rick Perry, alongside Democratic Party frontrunner former Secretary of State Hillary Clinton, as supportive of the deal. Graham, Paul, Dr. Ben Carson, New Jersey Gov. Chris Christie, and Wisconsin Gov. Scott Walker haven’t taken positions on the matter yet. Lousiana Gov. Bobby Jindal, former Arkansas Gov. Mike Huckabee, real estate magnate Donald Trump, and former Hewlett-Packard CEO Carly Fiorina are all publicly against the deal.